Cryptocurrency podcasts are a crucial tool for staying up to date in this rapidly growing space. They are an excellent content consumption tool for people that have little time to read, or that enjoy listening to something during their free time. Furthermore, although blogs and news sites are very valuable, sometimes its also important to get a direct insight into the opinions of industry leaders, something which podcasts enable in a beautiful way. In order to save you time, we created this outline of the 16 best cryptocurrency podcasts. Furthermore, to help you choose the right one, we also explain what makes each cryptocurrency podcast unique, and a few interesting facts about it. 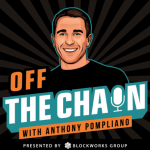 Off The Chain is a brand new cryptocurrency podcast launched in 2018 by Anthony Pompliano (“Pomp”). He is the founder of Morgan Creek Digital, where his goal is to onboard institutions intro crypto by “Getting them off zero”, which is a term used by Pomp to describe that everyone should have at least a tiny amount of digital assets. That being said, most probably know Pomp from Twitter, where he amassed a community of over 100K followers. Pomp is very well connected in the finance world, which enables him to host fascinating guests on his podcast like the former CEO of MySpace, and also Gabor Gurbacs from VanEck. Due to his finance background, he also covers extensively the topic of security tokens. The podcast already has tens of episodes and new ones are added on a weekly basis. Off The Chain is definitely one of the best cryptocurrency podcasts and deserves its spot as #1 in this article. Laura Shin, a former cryptocurrency Editor at Forbes, is the host of podcasts Unchained and Unconfirmed. 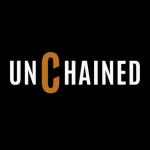 While Unchained is focused on interviews with big players and entrepreneurs in the cryptocurrency space, like CZ from Binance, Unconfirmed aims to be a shorter and more lightweight podcast. Both podcasts definitely deserve a listen and perfectly reflect Laura Shin’s years of experience in the media industry. 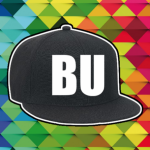 Hosted by Bitcoin Evangelist Chris de Rose, Bitcoin Uncensored is a podcast that cuts straight to the point, often leading to slightly heated conversations with the podcast guests. The podcast covers everything from new developments in the cryptocurrency space, to personal stories from interesting guests. Chris de Rose also live streams all of his podcasts in a video format on YouTube, so if you prefer video instead of just pure audio, you should definitely check out his YouTube channel. 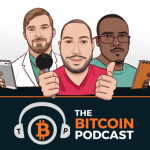 Although the podcast is clearly inclined towards Bitcoin maximalism and PoW projects like Monero, it is definitely worth a listen if you are looking for a podcast that leaves the formalities aside and dives into very direct and personal conversations. 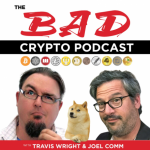 The Bad Crypto Podcast is a new show launched by Travis Wright and Joel Comm. It initially gained traction after hosting a podcast episode with John McAfee, who then recommended the podcast to his vast following on Twitter. The Bad Crypto Podcast mainly focused on discussions related to the market, investing, ICOs, and altcoins. The podcast can get a bit absurd from time to time, so if you are looking for a non-technical show that combines comedy with cryptocurrency, then this podcast is for you. Having launched back in 2013, The Bitcoin Podcast is one of the most iconic shows in the space. Furthermore, what started out as a single show has now turned into an entire podcast network, featuring tens of different shows and hundreds of episodes. This conglomerate is known as “The Bitcoin Podcast Network”. 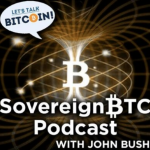 As the name suggests, this podcast is mostly focused on Bitcoin and infrastructure related to it. Hence, if you are looking to learn more about the most popular digital asset then this is definitely a cryptocurrency podcast to give a listen. While most of the best cryptocurrency podcasts that we cover in this article are focused on in-depth analysis and interviews, CoinMastery is purely focused on cryptocurrency news. Hosted by investor Carter Thomas, the podcast summarizes the most important cryptocurrency and blockchain news in a short and easy to understand format. If your daily routine does not leave you much time to read, then the CoinMastery podcast is an excellent way to stay up to date with the latest developments in the fast-moving cryptocurrency space. a16z is short for Andreessen Horowitz, a prominent VC fund in Silicon Valley. 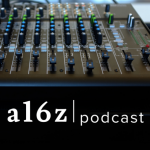 The a16z podcast usually covers any up and coming technology, however, due to the blockchain’s recent popularity, the podcast has dedicated several episodes to the topic. 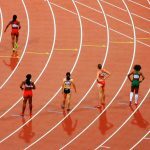 The podcast can get a bit technical and in-depth at times, so it might not be the ideal starting point for someone new to the cryptocurrency space. 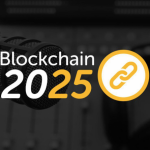 Blockchain 2025 is a brand new podcast of the Bitcoin.com network, hosted by Matt Aaron. As the name suggests, the podcast is entirely focused on discussing the potential future impact of blockchain technology. Bitcoin is only rarely mentioned. Matt hosts several cryptocurrency podcasts and absolutely knows what he is doing, hence why we definitely recommend this show if you want to learn more about blockchain technology and its implications. 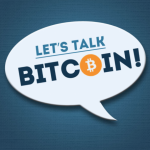 Even though the title suggests that this podcast show will only talk about BTC, that is not true. 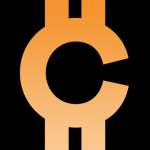 It actually provides content on everything related to cryptocurrencies. It provides all types of information on the new digital economy and the future of money. What I like the most about this show is that they bring new participants to nearly all shows. This way you have interviews and different opinions from professionals regarding the ‘hot’ topics. Listen to all of the LTB shows. 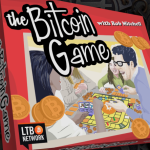 The Bitcoin Game is another fairly new podcast. However, that does not make this show any worse. I actually enjoy to listen this one much more, but I have to say they are longer than those of LTB. For some that might not be a problem, but for those of you who do not have too much time in hand, I would recommend you to listen to the previous podcast mentioned. It all happens in the United States where a bus travels through different states interviewing “real” people (by real I mean that they are simple and common citizens just like us) and exploring fantastic stories. All of this is backed up with talks on the cryptocurrencies. Definitely one of my favorite. 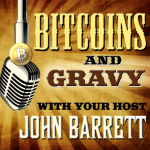 John, the host of the Bitcoins and Gravy podcast, has been broadcasting on the radio in the past, and he does a great job at entertaining. He uses his own music for his podcasts, however, in my opinion, he should make less use of them… Not because they are bad, but because I get distracted listening to the tunes instead of listening to the actual podcast. If you do not mind the music in the background, then this one might be the podcast you need. He usually talks about Bitcoin, but some of his shows are on other cryptocurrencies. What I find missing on the show, is that it misses new people. John should consider taking into the show other professionals either to interview them about some concepts or gather ideas from them. 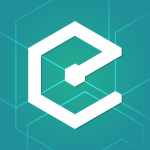 The Epicenter podcast covers Bitcoin, Blockchain, and the cryptocurrency space in general. It has three main hosts which are really interesting to hear to in my opinion. They bring a different guest for every show, and they are people that are very comfortable with the crypto news. These are usually entrepreneurs, academics, industry experts and many others from all over the world, which gives it a more general opinion and view to the concepts discussed. This one is one of my favorites and definitely one of the best cryptocurrency podcasts out there because they always bring top people into the show, which raises a lot the level of information provided, and makes the show incredibly interesting. Are you an Ethereum fan? Would you like to know more about ETH or any other crypto news? 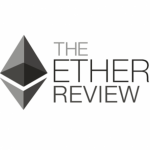 If you are interested in it, then the Ether Review is your podcast. With many interesting shows you can listen to, (67 at the moment) The Ether Review is one of the most varied podcasts of all. They do money talks, discuss new projects related to the cryptocurrencies and they sometimes take guests like cryptographers or people such as Erik Voorhees. 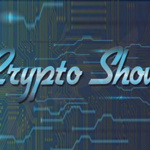 The Crypto Show has more than 250 podcasts in the present, which provides us listeners to have a wider variety of content. They make very good discussions with different guests in nearly all shows. This can give us a wider response to the many questions asked in the market, with the benefit of taking better decisions in our investments. Always remember that the more knowledge, the more power you have. I have to say that these shows are somewhat very extended, with around 90 minutes to listen per podcasts. If you do not mind the length, then this one is a technical but also interesting show to take into account. 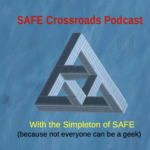 SAFE Crossroads is a very popular podcast covering high-tech in general, however, it also has several episodes that dive deeply into the fundamental value of cryptocurrencies. You can not buy an asset only knowing what it does or how it develops, you have to know what surrounds that asset. 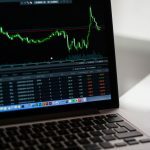 Having said this, SAFE Crossroads can give a wider view to those investors who want to know more about other factors affecting their assets/coins (investments). Are we missing an important cryptocurrency podcast on the list? Please do let us know in the comment section below!